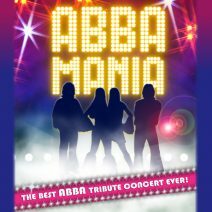 With all your favourite ABBA hits including: ‘Mamma Mia’, ‘Voulez Vous’, ‘Dancing Queen’, ‘Winner Takes It All’ and ‘Super Trouper’, the world’s number one touring ABBA tribute bring you a night not to be missed! If you’re looking for an excuse to party, reminisce or simply be entertained by the best music ever, then dig out those platforms and dust down those flares as ABBA MANIA is for you! What better way to bring the 2019 Kilworth House Theatre season to an end? You will be offered Pre-Theatre dining after you have chosen your tickets. If you have already purchased tickets for this event, then you will need to contact the Box Office to book your table on 01858 881939. What better way to enhance a wonderful evening of entertainment than enjoying a delicious three course dinner and relaxing night’s sleep for two at the Hotel to complete your Kilworth Experience, the theatre break price includes two show tickets. Price is for double occupancy of a Garden Bedroom. For single occupancy there is a £75 reduction. Luxury Room Supplement £100. Check in time for bedrooms is from 4pm. Please call the Sales Office on 01858 881805(Mon-Fri, 9am- 5.30pm).